As a wheelchair user, I’m a total sucker for drive-through anything. Drive-through banking, drive-through fast food, drive-through coffee, drive-through library book drop, drive-through liquor store—anything that enables me to get an errand done without getting me, myself and my wheelchair out of the car is pure gold. So I’m sad to announce that Starbucks is getting rid of its drive-through trash receptacles. I don’t know if this is a corporate decision, but it seems to be true for most of the Starbucks I hit around here. According to employees, this is because people put nasty things in the trash cans. That’s very anti-social behavior, people! Because of you, my car is full of random receipts, coffee cups, and candy wrappers. Katja, In here, I have seen stickers on gas pumps that ask you to honk if you need a service attendant to pump gas for you. I have driven through and to NJ so many times but have never had a chance to get gas there. Yup, and like the guy in the video says, most places you can honk until the cows come home and you won’t get any response! Sweet! We had a full service gas station in Boulder for about 5 minutes, but it closed recently. Katja, I bet if you handed the Starbuck’s barista your trash, s/he would take it for you. They have a strong customer-oriented culture, or at least they do here in Seattle where Starbucks was founded. 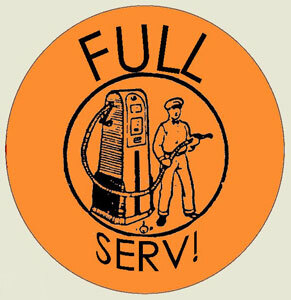 You should move out to Or-y-gun: State Law in Oregon forbids pump-your-own gas. I’m in Washington State and always get confused when they run out to fill it for me! P.S. Nice blog, Katja. I always appreciate your comments on corporette. I just realized that you talked about Oregon. Oh, well. So much for my reading comprehension after a 12 hour work day. Hi, Coach Laura, thanks for stopping by, and for commenting! Yes, the SB baristas have on occasion taken my trash as well – I just hate asking for favors, and wish the world were set up so that I could get stuff done without that.